One summer during college I interned at the Los Angeles Chamber Orchestra, which was full of bohemian art-types who enjoyed fancy things. And one particular Friday in July, the secretary organized an indoor picnic potluck lunch. I made a joke about bringing peanut butter and jelly with the crusts cut off, but everyone thought that was a great idea. 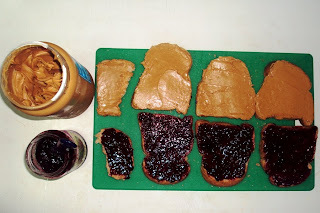 But what sounds good in theory is not always good in practice, and the middling results have convinced me to never bring peanut butter and jelly to a potluck ever again. The Peace Corps experience has an alarming number of potlucks built into it. Most large volunteer gatherings involve an element of BYO or BSTS (Bring Something to Share), and a fair amount of teacher parties at my school require attendees to “bring a plate.” This is particularly difficult for me because my kitchen isn’t equipped to handle large-scale food preparation. I have a camping stove and a mini-fridge. What do you want from me? Today is the student teachers’ last day, and yesterday my pule asked that all teachers bring a “light plate”. I was told that this translates to sandwiches or cakes. October has been a budgetarily tight and I didn’t have time to go to the store yesterday and hell if I would have known what to get anyway. 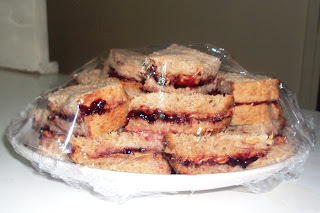 But thinking about it last night, I decided what better melds sandwiches and cake than peanut butter and jelly? I’ve heard two broadly divergent rumors about Samoans’ taste for peanut butter. My friend Ruane, the Red Cross truck driver, absolutely loathes it. She hates the texture and doesn’t care much for the taste. 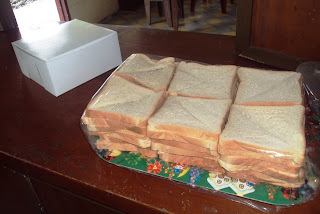 On the other hand, Paul told a story at our Early Service Conference about how, on Friday afternoons, he would make a large batch of sandwiches and offer them to his students as a reward for their work that week. And according to Paul they loved it. I’m heading out to the teacher function now. We’ll see how things shake out. At first reception was tentatively accepting. I had to walk past a bunch of students to make my way to the teachers’ lounge, and students definitely found them appetizing. I got cat calls and requests for a bite or two. When the buffet line started in the teachers’ lounge, the peanut butter and jelly mostly went unnoticed. My vice pule picked one up, and quickly called me over to tell me how good it was. But it was the kind of deal where I wasn’t sure if she was just giving me lip service. She liked it a little too much and a thanked me a little too quickly, you know? The PB&J sat there for a long time, and I was starting to suspect they’d turn into leftovers. But then Tavita—one of the nicest guys on staff, also I often refer to him as Samoan Barack Obama—who’s been waiting to be last to eat, picks up one and tries it. He nods, and then takes all the remaining sandwiches. He didn’t know I was watching from across the room. So I’m going to chalk that up as one convert. I’m calling this a goal #2 success in my next trimesterly Peace Corps report. The finished platter. I cut the sandwiches into sixths. Other teachers' portion sizes were bigger. This platter of sandwiches is considered a "light plate"? maybe next you can get them to eat grilled cheese with no tomato. Your peanut butter display looks very nice.